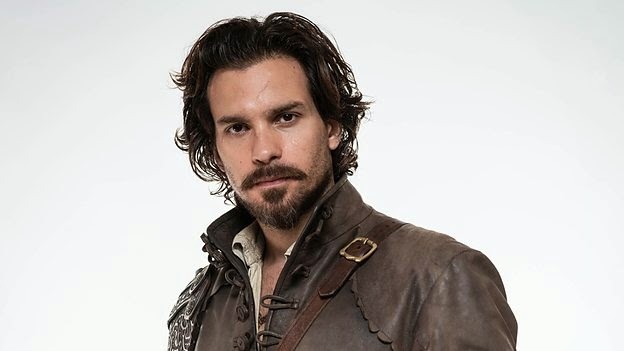 For the past 6 weeks, Friday nights have been dominated by my obsessive need to watch the swash-buckling gorgeousness that is The Musketeers on BBC1. Who better to illustrate the fast-moving antics of the Tarot’s Knights? The incredibly handsome cast of Muskys have been a delight to watch as they struggled with the evil Rochefort as he plays the spineless French King against his Queen like the consummate player (and Spanish spy!) that he is. The second series drew to a close on Friday (what do you mean, you haven’t watched Series 1?!) and I await news of a third series with bated breath. So, let’s take a look at just which Musky equates to which Tarot Knight! 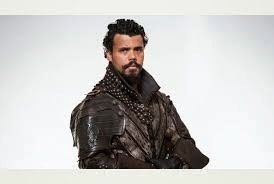 The most physically strong of the Musketeers, Porthos is also the most exotic-looking. Offspring of a North African servant mother and a French Aristo father, actor Howard Charles, is the embodiment of the dependable, powerful and resiliant Porthos. 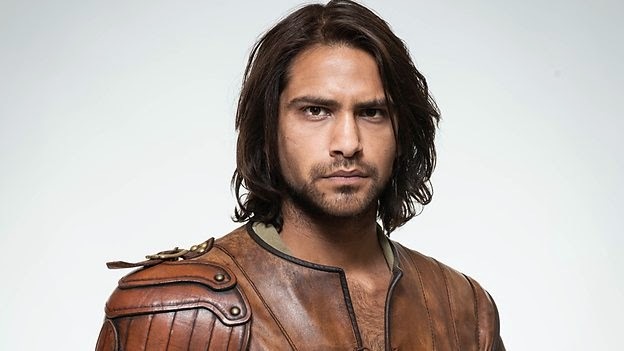 Poor Porthos doesn’t get much in the way of romantic story-lines, but he’s the strength and backbone of the Musketeers – carousing and punching his way through the series! What does the Knight of Pentacles mean? The Knight of Pentacles is slow to rouse to passion, but when his blood is up, he is determined and focussed. He will not be easily put off or distracted, but could, unfortunately, be mistaken for the most boring of the Musketeers. Ladies, wise-up. Aramis is the romantic one. After falling in love with the Queen and their eventual encounter in the Convent, Aramis becomes her Knight in Shining Armour. Aramis’s love for the Queen is very much an idealised romantic union – she is utterly unobtainable and he loves her from afar. She is on a pedestal – would he be able to love her with such a pure heart if he had to visit the loo after her every morning? At the end of this series he devotes himself to God and goes off to become a Monk. He IS our Knight of Cups. The BBC cast Santiago Cabrera as Lancelot in their Merlin series a few years back. What can I say, the boy’s got IT?! What does the Knight of Cups mean? The Knight of Cups is a dreamer and a romantic. He has a loving heart and the soul of a poet. Prone to idealising the object of his affections, he is in love with the idea of love and might not have the cojones to knuckle down when things get tough. Let’s just pause here for a moment, shall we? Athos is our tortured Knight of Swords. 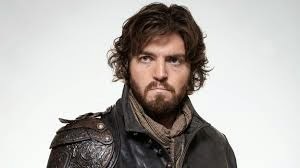 Wounded by the ‘betrayal’ of his wife, Athos keeps his heart to himself (because, his gloriously wicked wife, Milday De Winter actually still has it). Thoughtful, brooding, stealing EVERY scene that he’s in, Athos is the righteously intense Knight of Swords. What does the Knight of Swords mean? This Knight in particular lives inside his head and can fall prey to whatever demons lurk inside his head. Fast-moving and whip-sharp, the Knight of Swords relies on his brain-power to tell him what to do and doesn’t trust the truth of his emotions. Ah, and here he is – always the favourite Musketeer – D’Artagnan. Younger than his companions, he is impulsive and fiery. In Series One, he constantly tries to become a Musketeer. Athos et al regard him as a younger brother who causes much tutting and head-shaking by the others, before he is bailed out and dusted down for his next exploit. Keen as mustard, passionate and generous of spirit, D’Artagnan is played by Luke Pasquelino with glorious elan. What does the Knight of Wands mean? The fastest-moving of the Knights, The Knight of Wands burns brightly, but not for long! His passions are quick to rise, but he lacks the resolve of the Pentacles, the emotions of the Cups, and the clarity of the Swords. This is the guy who will promise you the moon to get what he wants and as soon as you have surrendered and been thoroughly ”explored’, he will move on to the next challenge. When called upon to describe what the Tarot knights are like as people, you could do a lot worse than remember the Four Musketeers! …I DID mention that the were a GREAT-looking cast, didn’t I? Well the women in the cast are equally unforgettable. Constance, Milady De Winter and The Queen – they will be in a later post! Now, saddle me up your finest stallion, we have a war to wage against Spain! I never liked d'Artagnan, too callow. Based on the films & book, not seen this series 🙂 What card is Richelieu ? VERY easy on the eye! We only really have 3 lead ladies which is a bit of a pain, but she would make an excellent Queen of Swords!, Coral!